This long-sleeved VapoDri Training Tee will keep you cool, dry and focused, whether you’re training hard or barracking for the mighty Blues at State of Origin. A superior tee with some serious attitude. You’ll stay cool and dry whatever you’re doing in our long-sleeved VapoDri Training Tee from Canterbury’s 2019 NSW Training collection. Whether you’re grinding it out on the training field or roaring for the Blues on Origin day, this is a superior tee that won’t let you down. It features our VapoDri moisture-wicking fabric technology that wicks sweat away from the fabric to keep you cool and dry. 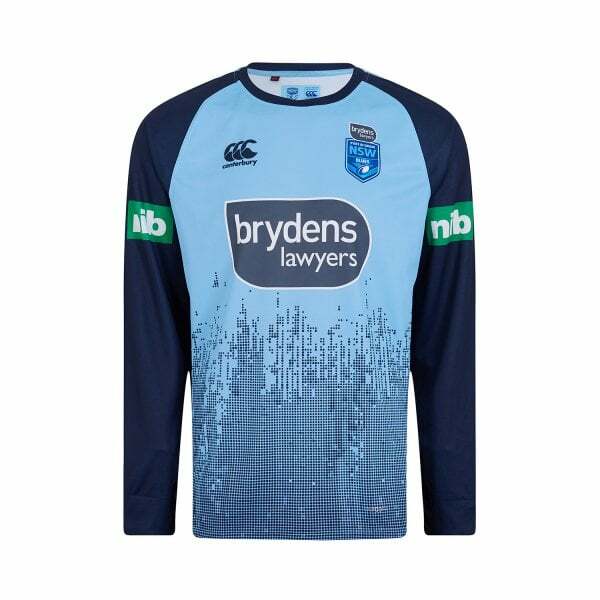 You’ll look cool as well with its official NSW team and sponsor logos. Wear it with pride knowing you’re supporting the mighty Blues and Canterbury; two great teams behind the world’s greatest game.